Scientific publication is an effective way to promote your company targeting other specialists in your area. The workload does not always allow one to write and submit articles on time. your papers and adapts them to the requested publishing format. 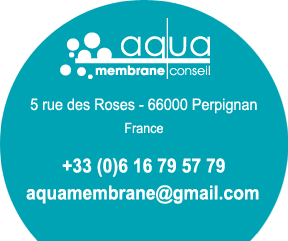 Aqua Membrane is a company or consulting firm in membrane filtration applied to drinking water treatment, wastewater, seawater, industrial water for industry, reuse or irrigation. Technically he apprehends phenomena related to membrane technology, the development of membranes and problems, advantages and disadvantages of membrane technology, audit of units, autopsy of membranes and modules, management of blockage or clogging, backwash or backwashing, cleaning or clean in place or CIP including CEB or chemically enhanced backwash. Its mission is to advise and assist communities, consulting engineers, water treatment companies seeking assistance to project management. Ethics and independence do not allow to sell membranes or the sale of membranes systems for all applications including water systems for general use and drinking water as softeners, non-collective sanitation, pools, aquariums, hot springs and baths.